The EYES & EARS consists of Conference and the International Eyes & Ears Awards. The conference will focus on current projects, trends and future perspectives in the fields of design, promotion and marketing of audiovisual media. The event will feature inspiring keynotes, excellent New Talents projects and current case studies from the fields of TV, film, Internet, mobile, games, events, advertising, art and culture. In the evening the International Eyes & Ears Awards Show will take place. For the 20th time, Eyes & Ears of Europe presents the International Eyes & Ears Awards for particularly creative, innovative and effective design, promotion and brand communication measures of the year. EYES & EARS 2018 offers the opportunity for personal exchange and networking. The event is a valuable trend barometer and a top-class communication platform for European developments in the audiovisual media sector for both professionals and young professionals from the fields of design, promotion and marketing. At the Conference, current projects from the fields of TV, film, Internet, mobile, games, events, advertising, art and culture will be presented. National as well as European and international broadcasters and agencies will give insights into their projects and thus convey new perspectives. By picking up on current media developments, trends and challenges, the talks offer participants inspiration and ideas for their own work. The Eyes & Ears New Talents provide a platform for young talents to present their innovative work. During the Conference, they present their projects to an audience of experts. The event offers them the opportunity to make direct contact with those who are always looking for young creative talents. At the same time, long-term media professionals will receive creative impulses for their own work. The EYES & EARS Get-together will take place directly after the Eyes & Ears Awards. With drinks, snacks and good music, the participants of the EYES & EARS can end the day in a beautiful ambience - exchange ideas about the highlights of the day, celebrate the award winners, meet new contacts as well as old friends and plan new projects. Since 1999, the Call for Entries for the International Eyes & Ears Awards have been announced every year in April in the categories design, digital (formerly interactive), promotion and cross-media campaigns. Until the beginning of July, the competition will be open to broadcasters, marketing managers, art and creative directors, promotion producers, copywriters, composers, professors, students and trainees. The different expert juries for the individual categories discuss the submissions and select three finalists per subcategory. The online jury will select the winner from these three entries. At the Eyes & Ears Awards Show, the selected entries will then be presented in a compact and entertaining form. At the award ceremony, the makers will be awarded the Eyes & Ears Trophy. In addition, the industry association awards the Eyes & Ears special prizes for particularly impressive overall achievements. 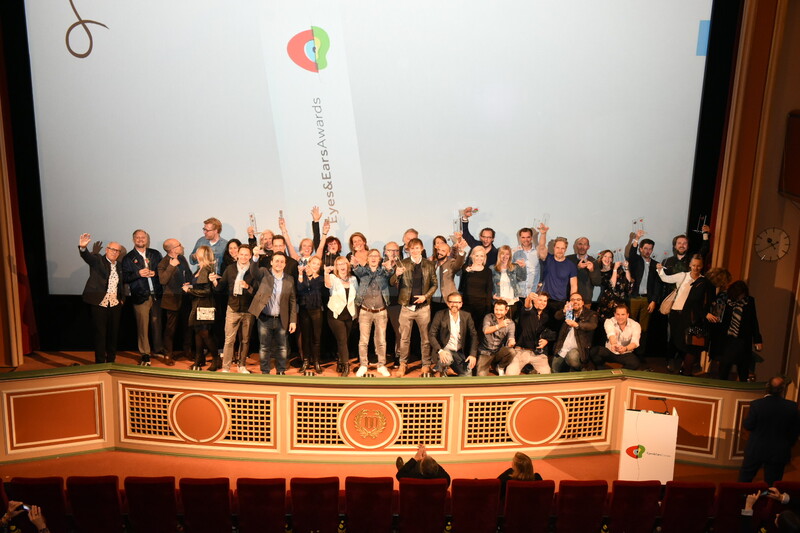 The Eyes & Ears Awards Show presents audiovisual highlights and current trends from the fields of design, promotion and marketing in a compact and entertaining form. At the same time, the show offers an unmistakable source of inspiration for one's own work.